Complexity – SOW’s are unique to each contract and can vary significantly depending upon the type of work required, the duration and the contract mechanism being established. Risks – the operational, financial, legal, contractual and reputational risks of a poor SOW can be very serious. Expertise – qualified writers who understand the operational, financial and contractual requirements of a compliant and enforceable SOW are in short supply. Time – the procurement process can never move fast enough for public sector program managers, and the development of a good SOW can be a very time consuming process. Few rules and no roadmap – there are few clear rules or standards in place within the public sector to define what a good SOW looks like, or how to write one. When there is a program or event to be delivered, time is limited and procurement requirements have not been planned in advance (for any reason), there is a strong impulse among some managers to take whatever measures they can to by-pass or look for shortcuts around the procurement process, and simply get it done as quickly and expediently as possible. And this is precisely where the majority of procurement risks emanate from. When shortcuts get taken; when full compliance with the rules is sacrificed in the name of expediency; when an open, fair, transparent and competitive selection process is by-passed in favour of a sole source contract, an Advance Contract Award Notice (ACAN), an amendment or some other similar mechanism, these decisions can almost always be identified as the leading cause of potential procurement risks to the department. To answer this question, RFPSOLUTIONS INC. developed the Statement of Work (SOW) Writing Guide ® document in an effort to assist public sector employees with the demands of the competitive procurement process, and in particular the demands associated with writing Statements of Work. Our hope is that it is of some benefit to managers in their efforts to meet operational procurement needs, while at the same time balancing the need to ensure compliance with the spirit and intent of public sector contracting policies. 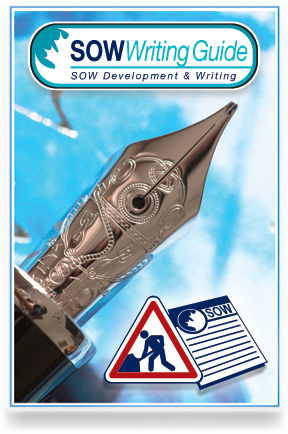 To download a copy of RFPSOLUTIONS’ SOWWriting Guide ®, click here. For a copy of the French version, click here.